They were sitting on a bench, in an apartment precinct in Kiev, Ukraine, when the 20-year-old woman was allegedly shot. It’s said the elderly woman saw them kissing through her kitchen window, got angry and allegedly fired a shot at the pair with her air gun. The pellet hit the young woman’s shoulder after which her shocked boyfriend, whose name isn’t known, quickly called the emergency services, reports Metro.uk. The stunned boyfriend made a statement to the local media. “We were sitting on the bench when we heard a sound like a clap,” he said. The victim is said to have been rushed to hospital and is in a stable condition,” HNV News reports. Apartments were then checked by the police and the suspected shooter was found. 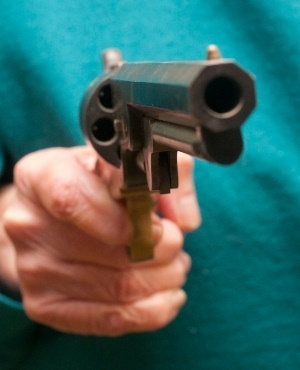 The elderly woman confessed as soon as police walked in, and the air gun and ammunition were confiscated, News One Place reports. “After a criminal case was opened, the suspected shooter was identified and interrogated. Even though the investigation is ongoing, she’s placed under house arrest as she has no criminal record and her age was considered,” a police spokesperson said. If she’s found guilty, the shooter will face up to seven years in prison.